The number of people using buses in England fell again in the last financial year in the face of real-terms fare increases and cuts to local routes. The figure for the year ending March 2017 of 4.44 billion passenger journeys itself represented a 1.5% fall on the previous year, according to DfT statistics published in December. In the year to March 2018, local bus fares increased by 2.8%, which officials pointed out was faster than the all items Consumer Prices Index rate of inflation (2.5%). Steve Chambers, public transport campaigner at Campaign for Better Transport, said: 'Today's figures show the continuing downward spiral of local buses continues. This is no surprise given the loss of thousands of routes and services across the country and the fact that bus fares are rising faster than other consumer items and far faster than wages. During the year ending March 2018, bus use in England outside London saw the largest fall, declining by 47 million passengers journeys to 2.15 billion (2.2%). DfT officials said this continued the decline since 2009 to a point where it is now 11% lower than the peak in the year ending December 2008. In London, where bus use has recently fallen faster than elsewhere in the country, passenger journeys decreased by 14 million to 2.23 billion (0.6%). Officials pointed out that this remains 3% higher than in the year ending March 2008. In the quarter from January to March 2018, bus use in London fell by 1.2% compared with the same quarter in 2017. Bus use in metropolitan and non-metropolitan areas of England also decreased over the same period. A Transport for London spokesperson said: 'London is leading the way in showing how it is possible to keep fares affordable while still investing record amounts to create better public transport and facilities to increase walking and cycling. 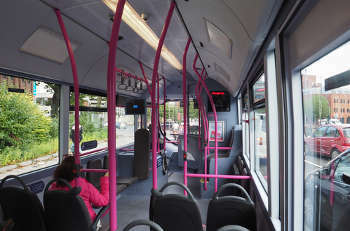 The Bus Services Act, which received royal assent in April 2017, was intended to reverse the long-term decline in bus patronage by allowing some local authorities to bring in franchising schemes, with mayoral combined authorities given an automatic right to do so. However the uptake of these new powers over the past year appears to be limited. Greater Manchester appears to be considering a move, yet is likely to face opposition from bus operators.